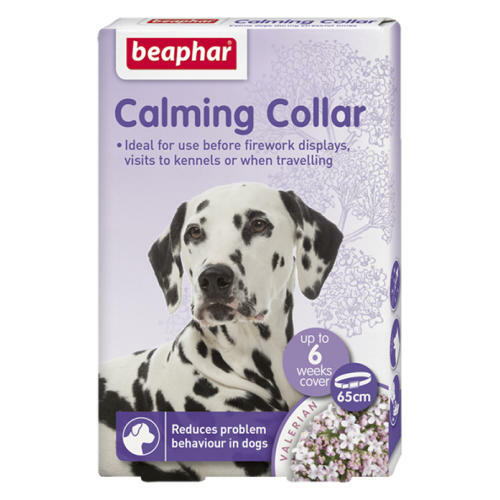 Beaphar Calming Collar for dogs effectively reduces problem behaviour arising from stressful situations in dogs of all breeds, sizes and ages. Using Valerian and Lavender which are often used in human healthcare to manager stress. It leaves dogs feeling calm, settled and relaxed, reducing potentially destructive problem behaviour. When dogs are more secure in their environment they are more relaxed thus making them better house companions. Keeping dogs calm will help to prevent excessive barking, chewing, inappropriate urination and can be essential in dogs that suffer separation anxiety. Once fitted, Valerian will be released immediately and the dog will begin to relax within approximately one hour. Fasten the collar ensuring a comfortable fit so that two fingers can be inserted between the collar and neck. If fitted to a growing dog remember to loosen the collar regularly. Cut off any excess collar and dispose of with the household rubbish. For the collar to stay effective it is important it remains next to the skin and does not get covered by any other collar the dog may be wearing. Do not open the sachet until you are ready to use the collar. If the collar gets wet, it will continue to be effective once it has dried. If you want to wash your dog with shampoo, it is best to remove the collar and replace when the dog is dry.